Preheat the oven to 275 degrees. Line a large baking sheet with parchment paper. Dampen a paper towel with vinegar and wipe the inside of a stand mixer bowl to remove any excess oil, then dry with clean paper towel. In a small bowl whisk together the superfine sugar and cornstarch to blend and remove lumps. In the clean bowl of the stand mixer fitted with the whisk attachment, whip the egg whites on medium speed until foamy. Raise the speed to medium and begin adding the sugar -cornstarch mixture 1 tablespoon at a time, until all the sugar has dissolved. (Rub the mixture between two fingers – you should not feel any graininess) Increase the speed to medium -high and beat until the meringue is glossy and holds stiff peaks, approximately 10 minutes more. Using a silicone spatula, fold in the vanilla and vinegar until incorporated, being careful not to deflate the whipped egg whites. Scoop the meringue mixture into 6-3 inch circles, forming a very slight well in the center. Bake until the meringues have crisped and puffed up, about 1 hour. Turn off oven and, with the door closed, let them cool completely in the oven. Whisk yolks and sugar together in metal bowl. Once blended, add lemon juice and zest and place mixture over a saucepan with an inch of simmering water. Continue to stir mixture with wooden spoon or heat resistant spatula until it starts to thicken (this may take 10 minutes). Once the consistency thickens and resembles pudding, remove the bowl from the heat and add butter, stirring until melted. Strain mixture through a sieve and cover with plastic. Allow to cool in the fridge. Once meringue and lemon curd are cool, scoop lemon curd into the center of each meringue. 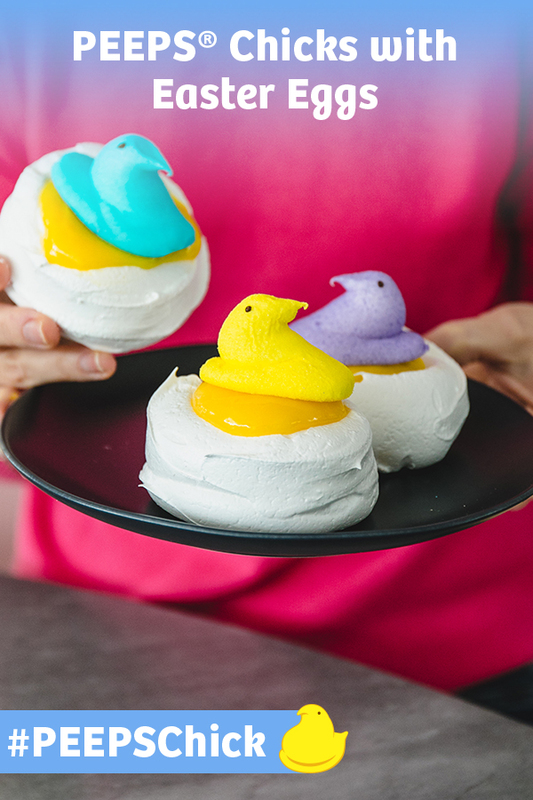 Place a PEEPS Marshmallow Chick on top. Serve immediately.